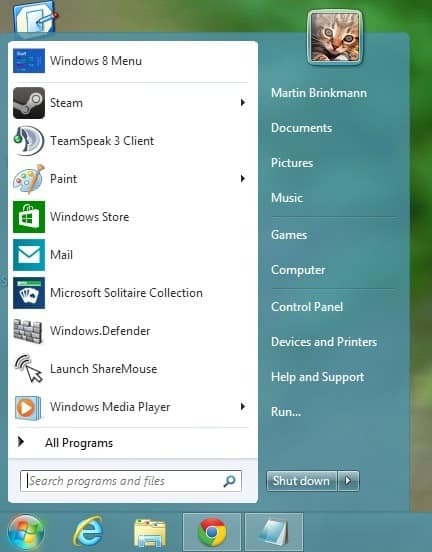 Of all the start menu replacements available for the Windows 8 operating system, I like Start8 from Stardock the most. The program, currently available as a beta version for Microsoft's upcoming operating system Windows 8, will be released as a final version this Fall. It was not clear up until now whether Stardock would continue to offer the program for free, which the company did as far as the beta version is concerned, or turn the application into a commercial program that users had to purchase if they want to keep using it once the final is released. When you visit the Start8 page right now you will notice the new get it now button near the bottom of the page. Beta downloads are still available, but you can alternatively purchase the app for $4.99 to get direct access to the beta and an upgrade to the final version when it is released by the company. While not explicitly mentioned, it is likely that the beta version will run out eventually so that users will either need to upgrade to the final version of the program or use a different start menu program on Windows 8. A program that is freely available is Classic Shell that is providing a similar experience to what Start8 offers. The major difference here is that Start8 includes Windows Store apps in search and the start menu, while Classic Shell does not. Start 8 is definitely a great program, and the price seems to be just right for this kind of application. Still, if you do not want to pay $5 for a start menu, you can easily use Classic Shell or another free alternative instead. What's your take on the price? I do prefer to design menu by myself with some free launcher than pay $5. Fair price. Ignoring W8 is the better solution though. The price isn’t bad, and I get that it’s not actually a Microsoft product, but this is what I’m most concerned about with the direction of Windows 8 – that we’re going to wind up having to pay piece by piece for basic functionality and that the lure of microtransactions will cause software companies to cripple their own products so you have to pay again and again to actually use them the way you want. Fortunately there are free alternatives, but I guess I can’t see past the symbolism of the Start Menu being available as a $5 extra. I am perfectly content with my Windows 7 and think Windows 8 is a step back in every possible way. I am perfectly content with my Windows 7 and I think Windows 8 is a step forward in every possible way. – ugly Metro/Modern/Win8 UI — when we have rounded icons and rounded UI rectangles in all other OSs, aren’t squares a step back? They are. – Immersive concept — People, I swear I knew truly immersive OS! It is called DOS. Isn’t OS with less applications on screen step back to only one? It is. – No start menu — oh, DOS hadn’t it either. Remember Norton Commander and its clones? They had two panels (what MS never got) and User menu feature. But now MS guides us back to DOS — no User Menu, put links on one of 2 desktops or type your commands if you want… In DOS you had to type your commands too. – Remember, what letter “P” in PC meant? Once it was your Personal Computer. But times changed. Siiiigned drivers, siiiigned shop, siiiiigned registration, there going to be siiiigned boot. SmartScreen (which abbreviates to SS — nice sense of humor, guys) “protects” you from applications and links MS don’t want you to run and visit. So, do you feel your PC with WIn 8 as personal as it was with Win XP? I don’t, and for me it’s a step back — from my Personal Computer to Corporation-Controlled Computer. The price isn’t too much, but the idea of paying anyone for what should be a core part of the OS really bugs me (and I don’t intend to ever use Metro apps or whatever they call them now), so I’d go for a free alternative. I’m probably just going to stick with Win7, though, so it’s strictly hypothetical. Start8 has 1 advantage it does not kill the Modern UI just places it in second place so all apps are available. I use it as I had a major disc drive crash and restore disks from Gateway just placed my computer in a boot loop. Windows 8 got it up and running. Plus I’m now downloading some of the apps for the modern UI.